I have a confession to make: We’re not really spending a year in a room. In the eight months we’ve lived at Beacon Hill Friends House we’ve travelled extensively both for work and for pleasure. In fact, I’m writing this post from Hue, Vietnam. I don’t see these trips as an escape from community, but rather a chance to explore community in different ways. Within the villages as within the nation, the amount of arable land was absolutely inelastic. The population of the village remained stable, and so to accumulate wealth meant to deprive the rest of the community of land, to fatten while one’s neighbor starved. Vietnam is no longer a closed economic system, but the idea remains with the Vietnamese that great wealth is antisocial, not a sign of success but a sign of selfishness. The ways we share space or make room for one another (or not) color our own happiness as well as the health of our community. Among the scenes I’ve found most compelling in Vietnam is traffic, as reflected in the accompanying video captured by one of our travel companions, Bob Fox. Some really big intersections have traffic lights, but many intersections appear to have neither lights nor stop signs. On our first night in Hanoi we experienced this from the vantage point of a pedicab. Picture several hundred motorbikes, cars, taxis, tour buses, pedicabs and bicycles converging from four directions on an intersection without traffic control devices. Oh, and add in some pedestrians trying to cross the street. Somehow this mass of humanity and machines finds ways to make room for one another – all without any apparent road rage. In the United States, we seem obsessed with space – or more precisely claiming and defending our own space. If someone squeezes into a lane of traffic, horns blow and road rage often follows. 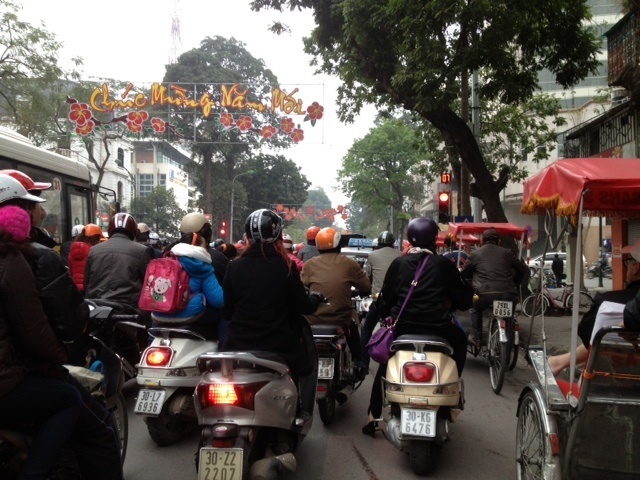 So how do the Vietnamese handle these crazy traffic situations with such grace? I got some clues when our guide taught us how to cross the street. He told us to move with confidence at a steady pace, neither stopping nor speeding up. In other words, we should be clear, predictable and confident in ways that enable people sharing space with us to move around us without mishap. Confidence goes two ways. It requires trust in oneself, but also trust that the other will, in fact, make room for you. All of this has me wondering. What would it take for us to be more hospitable, to make more room for one another? If we focused on making space rather than defending it, might we eliminate some of the pressure afflicting our lives? Where have people made room for you? This entry was posted in Community, Downsizing, Travel and tagged Posted by Carol Mitchell. Bookmark the permalink. 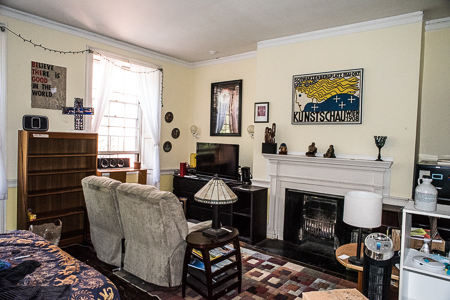 I love the Fitzgerald quote, Carol, and the idea that your travels are bringing you into new communities rather than removing you from the community represented by your one room in Boston. I am reminded of the Native American concept of land ownership—that no one “owns” land; that all land is a common asset to be shared for the common good. The Native and Vietnamese ideas clash so clearly with the American value system that valorizes the individual over the community and applauds massive accumulation of property by individuals even though such accumulation clearly works to deprive masses of people of access to opportunities of all kinds. Please keep your reports from the road coming.